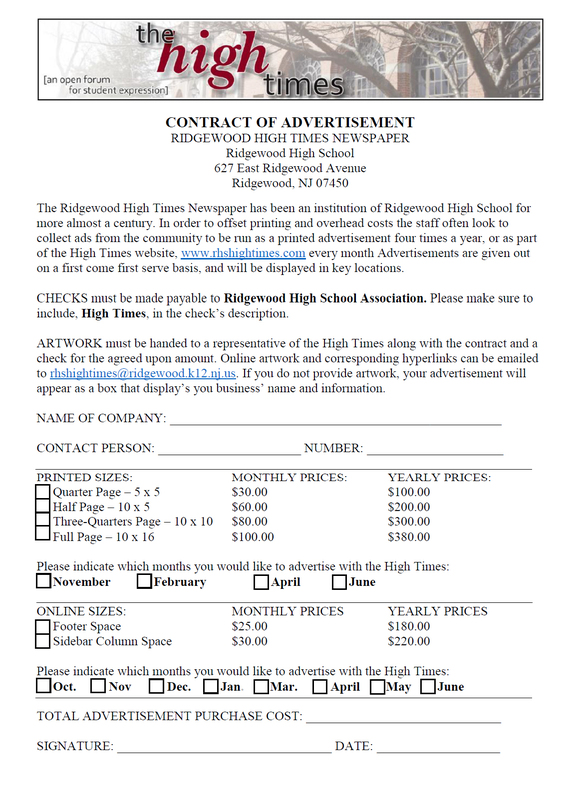 Thank you for your interest in advertising with the RHS High Times. 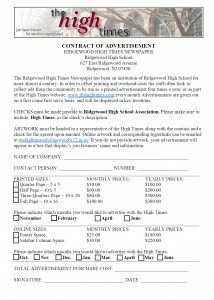 The Ridgewood High Times Newspaper has been an institution of Ridgewood High School for more almost a century. In order to offset printing and overhead costs the staff often looks to collect ads from the community and student body to be run as a printed advertisement four times a year, or as part of the High Times website every month. Advertisements are given out on a first come first serve basis, and will be displayed in key locations. CHECKS must be made payable to Ridgewood High School Association. Please make sure to include, High Times, in the check’s description. ARTWORK must be handed to a representative of the High Times along with the contract and a check for the agreed upon amount. Online artwork and corresponding hyperlinks can be emailed to rhshightimes@ridgewood.k12.nj.us. If you do not provide artwork, your advertisement will appear as a box that display’s you business’ name and information. The RHS High Times reserves the right to refuse any advertisement that can viewed as insensitive or inappropriate. Online issues run every month and will appear on the sidebar or footer on every page of the High Times website.